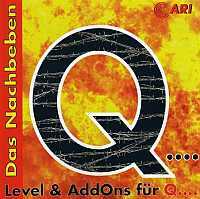 This German compilation (which means The Aftershock) is of the wildest, best, and hardest addons for Quake. There's massive levels for deathmatch and single player, informative texts and new weapons, sounds, fonts, texts, icons, cursor, screensaver, a whole range of Shareware programs and editor tools. It was made for Win 3.1, Win 95. The CD has an auto-start that immediately opens up a manageable menu.